The funniest thing happend yesterday at the golf club. Two of the guys that we hanged out with suddenly said: “hej allihopa!” to each other, and started to laugh. I was like: “What did you just say???”. -Where did you get that from. -Aaa, we didn’t know that, we just think it sounds funny when she says it. What does it mean? It turned out that these guys mocks a lot of movie stuff but it was really hilarious to hear them say it in nearly perfect Swedish, and be able to understand where they got it from (my first thought was of course Dumb dumber). Ingen toppenfest kanske men väl en stor dos Amerika, och mer skulle det bli. Vi var uppe kl 06.00 idag, detta pga att vi skulle till Michigan stadium och kolla på football. Detta innebär här att alla åker till den närliggande golfbanan kring 07.30 för att “värma upp” inför matchstart kl 12.00. Familjer och ungdomar (>21år) riggar här upp sina bilar, stolar, grillar, flaggor, spel, tält, paraboler, TV’s, ölfat, stereo anläggningar och Gud vet vad. Jag glömde kameran så ni får hålla till godo med mobilbilder, för bilder är vad som krävs för att beskriva detta skådespel. Säga vad man vill men trevlig var det, speciellt att testa på de olika spelen som alla gick ut på att kasta och träffa något på ett eller annat sätt. Idag var vi 107 765 personer som hejjade på Michigan Wolverines mot Miami Readhawks i Michigan Stadium “The Big House” . Såg lite ut som en landskamp mellan Sverige och Ukraina för ALLA bar verkligen blågula T-shirts och kepsar (ja, jag ska skaffa en=). Det som imponerade mest på mig var alla de ramsor och ritualer som publiken hela tiden ägnade sig åt, inte en lugn stund här inte. Men som ni kan se på bilderna så stod jag också i den gula studentsektionen (ca 15 000 studenter) vilken givetvis förde mest väsen. I had many prejudices before arriving to the US for my first time. Prejudices that I’d got from movies, TV and of course people who’s has been here. Some of them have been fulfilled and some of them weren’t even close. Some of them are obvious like: “they have bigger cars than us”, yes they sure do. But it’s hard to believe that the difference is so huge before you’ve actually seen and experienced it. I’m now going to present to you, some of the things that I’ve found very American and odd. 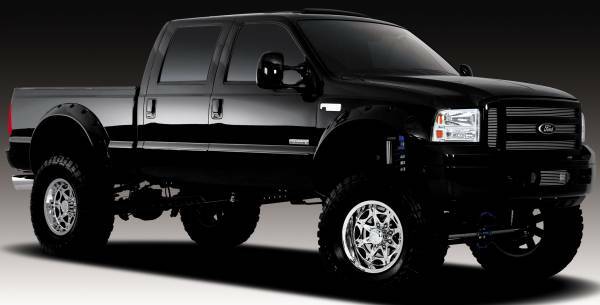 Cars: This car is common here: Ford F250, say no more. Toilets: In Sweden we’ve got this “small flush”-button on todays toilets. Over here they just fill up the whole toilet with water and when you flush, it empties the toilet and fills it up again (and I guess that it uses a lot more water). Alcohol: The beer here is really cheap compared to Sweden. You can get 24 cans of Miller for example, for less than 15$ (100sek) and you pay about 2-5$ for a beer at the bar. Drinking and driving is unfortunately very common here and you’re allowed to have up to 0.8 per mill. But there’s a rule against drinking in the car. Not even the passengers are allowed to have an open bottle in the car. Concerning the consumption of alcohol: I believe that Americans drink more often but not as much at the time as the Swedes do. This might have to do with the fact that alcohol is more accessible here. Wasse left for Windsor today so I’m quite bored (already), but I’m looking forward to school next week, and tomorrow we’re celebrating Labor day! Walking!? You mean you’re not driving? After two days here in Dearborn, I’ve had time to check out the area around the school, the big Fairlane shopping mall (great shopping) and some stores and a restaurant downtown. I must say that it’s not even close to any place in Califonia when it comes to being nice and cozy. You see more cars than people when you walk around and there’s big roads everywhere. Anyway, the school seems nice and everyone there is very friendly and helpful. I’m almost done with my course registration but I’m on the waiting list for some courses so I’ll get back with my full schedule later. Yesterday my flatmate Nick arrived (in his Porsche Carrera). A very decent guy that is going to study computer engineering here at UMD. He’s from Santa barbara-CA so everyone is asking him why he’s going to Michigan but he says that this is a really good school for him so he’s willing to give up the good weather for a good education (or something like that). Like I said before, the apartment is great but we got some issues. Nicks furniture is running late and wont be here before the 4th, and we got no hot water (gas) until the 8th because there’s been a problem with the gas company. The good thing is that we got a exercise/pool-area that’s located just round the corner where we can take a shower. I’m now in Michigan – Dearborn, and its dark and warm outside. After three flights my head is starting to feel a bit tired, and my first night here will be on a broad loom (heltäckningsmatta). Me and Wasse picked up the key to my apartment under a rug at the office where Ashley left it earlier. The apartment is huge and non furnished, yet. My roomie: Nick Evans from Santa Barbara will arrive here tomorrow, and his furniture a couple of days later. I will have to find myself a bed and a desk, that’s tomorrows project! Wasse will stay here (on the floor) with me for about four days before leaving for Windsor- Canada, just across the boarder. School starts 3rd of September, but we will give it a visit tomorrow I think. Mark Twain once said: “The coldest winter I ever spent was a summer in San Francisco.” They got four seasons here, and they change from day to day. We’ve had breeze and clouds one day out of three so I guess we’re OK.
We arrived here with our guide Arthur, who’s born and raised here in SF. He showed us some of the good tourist spots and told us stories about Chinatown and so forth. We made the city in about 6 hours, efficient! 1. Buildings and streets- Victorian houses and steeeeep streets. 2. Chinatown- Huge here in SF, only tourists and Chinese people. We’re privileged to stay in a very nice house here in SF. The owners name is George (who has a summerhouse in Sweden) and Wasse knows him through a friend of his family. George is in the real estate business and owns some very beautiful houses himself. One of them is one the famous Painted Ladies Houses which we where invited to yesterday. We had wine with him, Amber and his mother there and he told us the history of the house and it’s decoration. Very interesting! It’s located by the Alamo square park which is surrounded by beautiful Victorian houses. I took many pictures so have a look if you’re interested in architecture. We’re leaving San Francisco and California for studies tomorrow (me and Wasse are going to Detroit). I’ve had a great time here and hopefully I’ll come back. We arrived to LG and Wasses relative Marianne and her American husband Arthur on Thursday and left for San Francisco Saturday morning. Marianne and “Art” had a really nice big American house with pool and everything. Los Gatos is a wealthy area and the cities main street was full of fancy restaurants, luxury car dealers and of course houses to big for any Swede. A 300kvm house are here considered a small house, and houses bigger than 1000kvm are not uncommon. We will not have time to go to the famous redwood forest north of San Francisco so we went to a redwood park nearby LG called The Big Basin Park. The size of these trees are hard to describe even with photos but I think that you’ll get an idea of what they look like in my gallery. Thank you Marianne and Arthur for your hospitality!